Sitting in a Melbourne café waiting to speak to an industry veteran, I’m struck by the figure outside the window striding towards me. It is actor Terry Norris, 88, who has a decided spring in his step as he heads for his latest press interview. I’ve asked to meet to discuss his body of work, the most recent of which is ABC’s Jack Irish. As I discover, there is much to discuss and no sign of slowing down. “It’s been an interesting year for me,” Norris begins. “I turned 88 three weeks ago but at my age you can’t go hustling. This year I did Peter Jackson’s Mortal Engines in New Zealand which was very nice. “Then I did a little bit in Romper Stomper, then Jack Irish and I’ve just finished another film, Judy & Punch. It was a lovely crew, lovely cast with Mia Wasikowska playing Judy, and Damon Herriman playing Punch. A very interesting script and written and directed by Mirrah Foulkes. 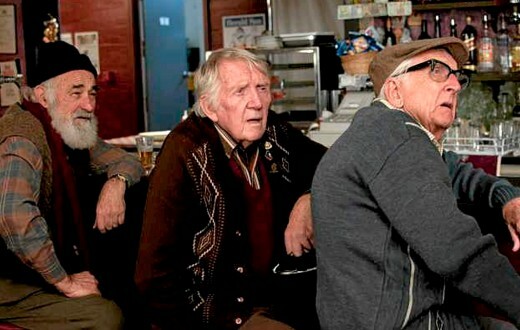 Norris is one of Australia’s most experienced character actors. His CV includes Power Without Glory, Blue Heelers, Changi, Stingers, Something in the Air, City Homicide, Killing Time, Miss Fishers Murder Mysteries, The Society Murders, Hawke, The Damnation of Harvey McHugh, Ryan, Consider Your Verdict, Hunter, The Last of the Australians, and films including Stork, Road to Nhill, Paper Planes and The Dressmaker. Work comes to him, as it rightly should after so many years, but as with most actors there is little pattern to it. At least that brings some spontaneity. “You can sit around on your arse in this business and nothing happens and then suddenly you never know when the phone’s going to ring,” he explains. “It’s something I suppose one could be cynical and I refuse to be. My main concern is that they’ve got the right address to send the money! Yet he has two daughters who did just that (one has since dropped out), and one son. Son-in-law Robert Connolly also happens to be the director of The Slap, Barracuda and Balibo. Family is precious to Norris, who has 4 grandchildren with veteran actress wife, Julia Blake (Bed of Roses, Prisoner, Travelling North). Melbourne-born Norris met British-born Blake in a theatre troupe after travelling to the UK as a young man. “I went to England when I was 21 as one had to in those days. Nowadays it’s LA. “The West End was one’s Mecca and so I went to England and I spent the next 12 years bumming around in repertory theatre. It was fantastic. Every town of every size had its own professional theatre. England, Ireland, Scotland, Wales, even the bloody Channel Islands I played. “We met in York, a lovely city, we were both in a company there. We got married between a matinee & evening performance of the show we were doing. They resettled in Melbourne in 1962 where Norris insists he enjoyed an enviable streak working in television, theatre, film and radio, including multiple guest roles on Crawford Productions. “Hector had that great stable of shows: Homicide, Division 4, Matlock Police, The Sullivans (Norris was in all but the last). “I had 20 years with the longest run of luck of any actor on the face of the earth! I was never, ever out of work. Sometimes doing two and three at the same time, because in those days there were lots of bits and pieces,” he recalls. In Bellbird he played mechanic Joe Turner, filmed at Ripponlea studios. After a day’s work he would jump on a train for evening performances at Tikki & John’s Theatre Restaurant or Brian Hannan’s Squizzy’s. Bellbird was a big soap hit for ABC, with Noris enjoying an 8 year run and even leading a campaign to save the show from a timeslot & format change. He followed it as the memorable Senior Sgt. Eric O’Reilly on Seven’s hit police show, Cop Shop, providing levity to the crime of the week. “It was a show that never took itself seriously. It had comedy in it which is most unusual for a police show. 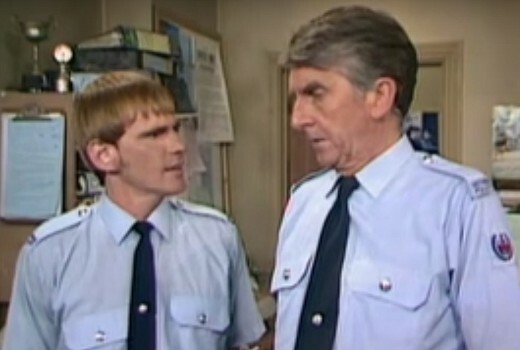 Gill Tucker (Constable Roy Baker) and I were the comedy relief,” he smiles. In Cop Shop he played father to Claire, played by Louise Philip. She had also been a regular in Bellbird, prior to a life-changing accident. Norris still remembers the day they were doing fan appearances in Wagga Wagga. “When we finished the presentation at one of the big department stores someone rushed in to say Louise had just been in a terrible accident outside of town,” he recalls. Although he hasn’t seen her in many years, Norris says she became a shopping centre manager in Queensland. 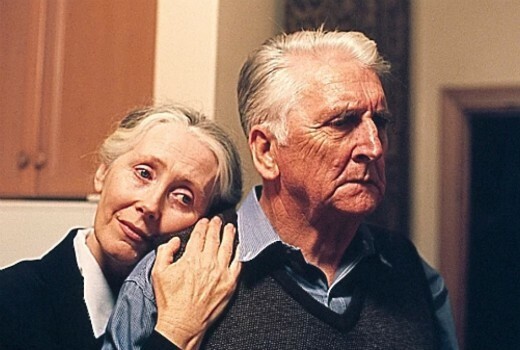 Remembering her fondly as “a lovely, lovely woman,” he admits to little contact with either Bellbird or Cop Shop cast, or any casts for that matter. “You know what this business is like. You have lots of acquaintances, but very few, what I would call, friends,” he continues. Although he lives within walking distance of ABC’s former Ripponlea studios, neither did he go to recent reunions and farewells. “I’m the sort of person that when I’ve done something I don’t want to revisit it. I’ve never looked back. I don’t like seeing anything I’ve done, mainly because I think ‘Oh my God I think I could have done that better.’ You’re never satisfied with what you’ve done. “I didn’t go to Ripponlea. I don’t like revisiting the memories. Isn’t it strange? It’s like class reunions. I’ve always been very reluctant. “I want to remember it as it was. And when I die I wouldn’t want any service, other than the family, sitting around saying ‘Dad’s gone, blah blah blah.’ I’d want nothing else. I’m not a person that enjoys memorials or tributes. “You ask me why, I couldn’t really tell you. “I can understand people doing it because in a way it’s rather like having a good bowel movement. You feel a lot better for it. You’ve got it out of your system. “It’s possibly an odd aspect to me in that regard. I’m not one for revisiting and going back which is possibly why I’ve got almost no close friends in the business. Lots of acquaintances but no one I could sit down with and unburden myself. In 1982 he detoured from acting to a 10 year term as a member of the Victorian Labor government, which he says emerged from union work for Actors Equity. Representing voters in Dandenong, he describes it as “an experience,” if not necessarily enjoyable. But one that gave him insight into humanity. “I had the biggest ethnic group in the state and the biggest unemployment and drug problem. It was challenging but nevertheless interesting. I worked my arse off and kindly (thanks) to the people I increased my vote at every election so I was doing something right. 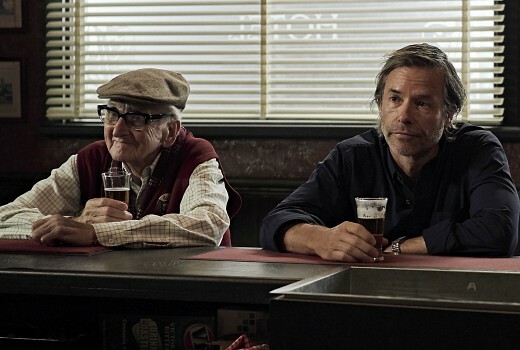 In his latest role for Jack Irish he is joined by veteran performer John Flaus as one of the barflies at the Prince of Prussia pub. This season, sadly, both are without their third partner in crime, the late Ronald Falk. “Dear Ron,” he smiles. “In this particular series we’re almost auditioning someone to take Ron’s stool right at the bar. “It’s a beautiful cast, led by one of the greatest professionals I have ever worked with, Guy Pearce. What a pro. Delightful person, lovely actor. Walks on the set, knows his lines -and he has an enormous work load. Scene after scene after scene . “Guy is a joy, no hassle, no problems. Charming. “So that sets the tone I think, for the atmosphere. But while he has two feature films yet to be released, Norris admits he doesn’t know what his next job will be. Yet neither does it seem to faze him. It’s all part of the tapestry. “You wait for the next phone call,” he adds pragmatically. 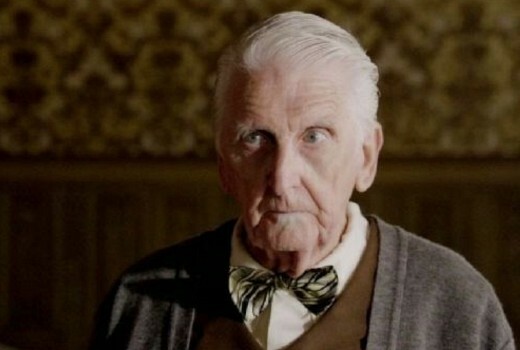 “I must be one of the oldest actors still working. And yet while he is indeed one of Australia’s oldest working performers, Norris resists overselling his achievements, preferring to let the work speak for itself. “Noel Coward’s autobiography, after his great body of work, was called ‘A Talent to Amuse,’ which is a sort of how most of my life has been,” he insists. Jack Irish airs 8:30pm Sundays on ABC. Ditto what everyone else has said in comments !! Great interview David. I directed Terry in many episodes of Bellbird and then Power without Glory, he was a joy to work with and always remembered his lines !! Just perfect as Joe Turner. An absolute legend. Great seeing him on Jack Irish. Great interview. I am so enjoying him in his role in Jack Irish, this season particularly. It is an absolute delight to watch, and I hope they keep making the series for a very long time. Thank you, David, for such a wonderful interview with such a wonderful man! I grew up watching all the Crawford shows & have always been a fan of Terry & Julia. A wonderful interview, David.What an interesting life Terry has led and such an enduring presence Australian television over the decades. A very enjoyable piece to read, thanks David. A great interview, David and obvious your affection and respect for his enduring career. His face and voice and stature are all quintessential elements of Aussie tv culture for so many decades but especially the 60’s til the early 80’s where he was never out of work. I recall him winning a couple of Logies for Cop Shop in Outstanding Supporting Role if my memory serves me well. He had (has) great comic timing as well as a dignity on screen. I have been in love with Julia Blake for 40 years! Julia is just sublime. What a great couple. Thanks for this piece. Lovely man and such a charming actor. They don’t make them like him any more.